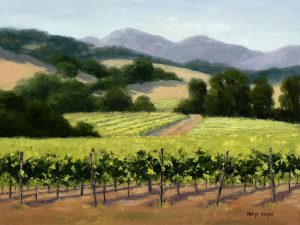 Summer Vines, Vineyard from Central California, north of San Luis Obispo, Santa Margarita Vineyard, painted in the early morning in the summer when vines are full and beautiful green. There was a beautiful backdrop of the hills and distant mountains beyond. Many of the trees are the coastal oaks, but there were also some eucalyptus trees in the scene. This is an original oil painting on linen.